Anthuriums are herbaceous epiphytes, native to tropical America. Anthurium is a genus of more than 800 species found in the New World tropics from Mexico to northern Argentina and Uruguay. The Anthurium is also known as Painted Tongue, Flamingo Flower (Flamingo Lily) or Tail Flower. Anthuriums are grown for their brightly colored flower spathes and their ornamental leaves. The red, heart-shaped flower of Anthuriums is really a spathe, or waxy, modified leaf flaring out from the base of a fleshy spike (spadix) where the tiny real flowers grow. 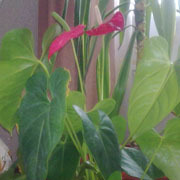 The anthurium flowers appear as a roughness on the spadix as compared to a smooth spadix. Most common colors of anthuriums are red and shades of red. A quick word on nutrition. Most growers use a slow time release fertilizer on their plants. Fertilizing should not be an issue for quite a few months. If you are going to fertilize, use a light solution of a 3:1:2 ratio and it is probably best to dilute to 1/4 strength. While Anthuriums are able to handle dryness around the root ball, they need to be watered thoroughly and allowed to dry slightly before watering again. Allowing the plant to dry out will greatly slow down the growth cycle. Drying out can also cause the tip to burn and root damage, while over watering can also cause root damage and sudden yellowing of leaves. Anthuriums are relatively easy to grow, have attractive foliage and under the proper environment, produce long lasting flowers year round. Commercially, pot type Anthuriums are grown throughout the world with the heaviest concentrations in the US (Florida) and the Netherlands. They are durable and will survive as an indoor foliage plant for a remarkable period of time, even under adverse conditions. Anthuriums grow best with day temperatures of 78 to 90 F, and night temperatures of 70 to 75 F. Temperatures above 90 F may cause foliar burning, faded flower color, and reduced flower life. Night temperatures between 40 to 50 F can result in slow growth and yellowing of lower leaves. Anthuriums will not tolerate frost or freezing conditions. Anthuriums are susceptible to the usual pests that visit out indoor plants, such as aphids, scales, mealybugs and thrips. Thrips and "mealy" are found more on new growth. You can also find aphids feeding on the flower buds. Scales seem to be particularly fond of the tough bird nest type. The best method of insect control is to monitor your plants and treat them before they get out of hand. There are some "insecticidal soaps" which work well on the soft insects, but scales may need a stronger insecticide. Under low humidity conditions spider mites may show up. One of the best ways to stay clear of the use of chemicals is with periodic wiping of the foliage and a gentle sparay of water. Make sure not to forget the undersides.